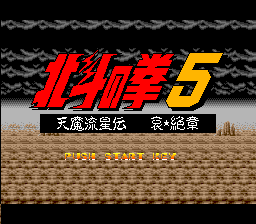 This game is sometimes written as Hokuto no Ken 5 - Tenma Ryuuseiden Ai Zesshou; this is the GoodSNES title. In the games credits / staff roll, the word director is misspelled Directer. The common English title is Fist Of The North Star 5.